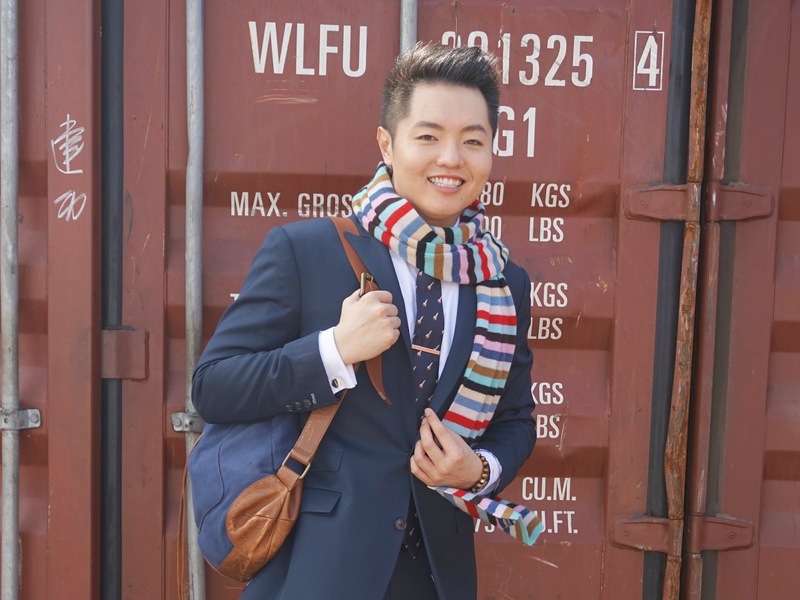 We are absolutely stoked to be able to introduce to you Hong Kong's most stylish (and ridiculously funny) banker bachelor, Watson Chao, who will be taking over our blog every Wednesday during December to give you guys some insider hacks on men's Winter fashion and style. Don't forget to follow him on Instagram (@cnostaw) for more awesome pictures - particularly of the epic jumping photos we took of him! This blue suit is my usual go-to, because of how easy it is to look put-together. A clean white shirt with a matching clean white pocket square plus some nice accessories can accomplish what I like to call "Real Life Photoshop", because it can make anyone instantly look better. The full suit and tie combo can be worn year-round, but when it gets chilly during the winter, I throw on the scarf for warmth as well as an extra splash of color. I enjoy the contrast and try to stay away from the grays and blacks that tend to dominate the finance industry when the temperatures drop. The Ted Baker backpack also helps during winter as it lets me carry all the knick-knacks I need while being able to keep my hands free, either to put in my pockets or wrapped around a hot coffee. I've always been a fan of shoes with a slightly slimmer silouette and I had been eyeing monkstraps for a while when I saw these lovelies go on sale at Mr. Porter (original price over HK$6,500!). These are actually my first pair of shoes from Alexander McQueen and I was pleasantly surprised by how comfortable they are, since I've always considered myself to have quite wide feet. The leather feels like it molded to the contours of my feet and not once did I feel like my toes are cramped. Plus, I love that they actually have a slight difference in the color of the leather, which adds a subtle flair that makes them more interesting than the norm. Cufflinks: YSL - free gift when I bought YSL cologne. I use these more than the cologne! If you plan to match, match the pocket square to the shirt, not the tie. An inexpensive material but well-fitting suit will always look better than expensive material but ill-fitting. I'm a fan. The look is super wearable. I'm also impressed that the suit comes from a HK custom shop rather than a brand. Nice. Good look overall where black boring suits and shoes are the norm in HK. The pants could be tailored a little more. 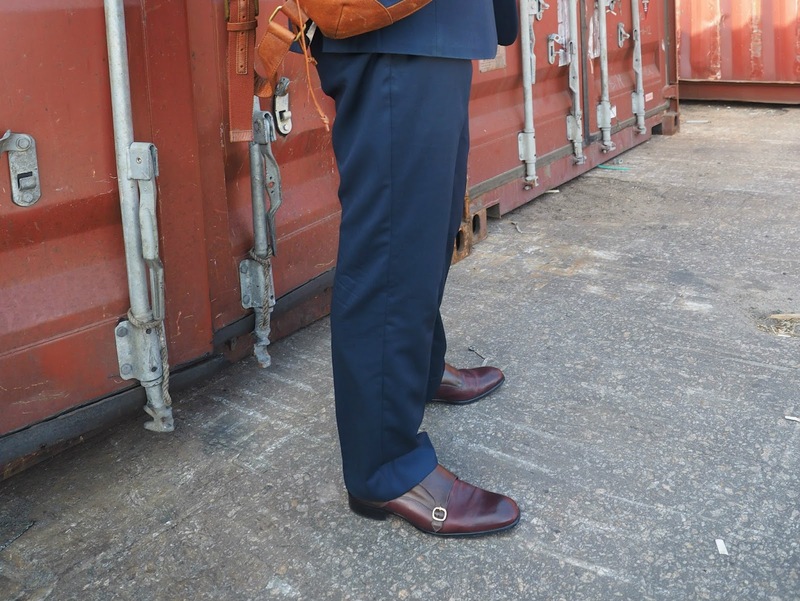 Usually not a fan of backpacks with suits but this works well. You could also get better made shoes for that price rather than going for 'haute couture' brand name. As a rule of thumb, fashion houses that make everything are rarely exceptionally good at making any one particular thing.